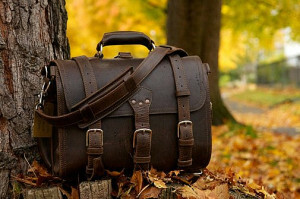 Encompassing a natural and rugged style, the Saddleback Leather Classic Briefcase is one of the highest quality and also most costly briefcase that I have reviewed. 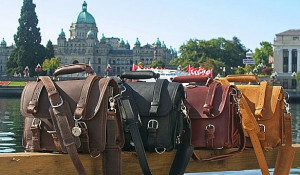 It is popular among leather enthusiasts as well as frequent worldwide travellers. In my review of the large version (which many believe to be the ideal size), I will be looking at whether all of the bags’ qualities justify its high price point. Everything from the full grain leather, stainless steel hardware and construction shouts out superb quality. Reinforced seams, stretch and stress points to ensure durability and longevity of the briefcase. Ability to convert into a backpack by adjusting the position of the belt. Ideal for frequent heavy usage as it’s able to handle a lot of bumps and scratches. 100 year warranty backed up by a friendly and responsive customer service team. Comes in 4 natural colours – Dark Coffee Brown, Chestnut, Tobacco and Carbon. As you probably would have guessed already, superb quality equals very expensive price. 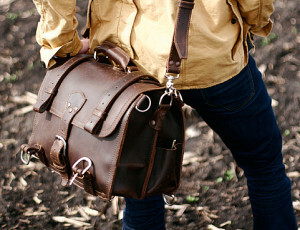 Due to the materials and size, the Saddleback Leather Classic Briefcase is big and heavy. Requires a bit of time to break in. Dimensions (inches) 16" x 12" x 9"
The construction on the Saddleback Leather Classic Briefcase is truly something to behold, and is something that is consistent in all of Saddleback’s other products. They’re able to separate themselves from the large majority of other briefcase manufacturers simply due to their design and craftsmanship. Each element of the Classic Briefcase is worth talking about. You can also watch near the end of my review to get an insight on how it’s made. Nothing but the highest quality full grain leather is used throughout the entire briefcase (and you can smell the aroma too! ), unlike other leather briefcases that use artificial leather combined with small sections of genuine leather, which to the untrained eye, you may not know the difference until a year or two of use. Constructed entirely of high quality full grain leather which has retained its original characteristics, aroma and durability. The leather used on the Saddleback Leather Classic still has all the scars and markings of a full grain type (imperfections provide character, fiber strength and durability), and the color will not rub off. In total, there are 52 different pieces of leather that make up the Saddleback Leather Large Classic Briefcase. 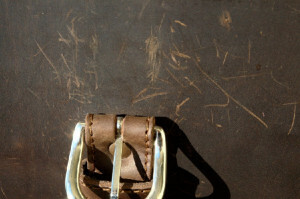 No two pieces are stitched together to make up a single piece, which cannot be said for cheaper briefcases. This means that there are less seams, and therefore, less chance of it coming apart. Bear in mind that the bag is stiff and rigid when new, so it will require some time and use to break in and soften up the leather. All the hardware that you see on the briefcase is made from stainless steel 316. 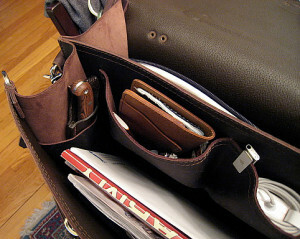 It’s rust free, higher quality and more expensive than lower grade steel (304, 303 and lower) which many briefcases use. As you may know, the most vulnerable part of a bag are the seams. They’re usually the first to come apart after constant use, so it’s vital for the stitching to be top notch if the bag is to last a long time. The Saddleback Leather Classic is a prime example of great stitch work. The first reason is more the case of less stitching as there are less seams because all the pieces of leather used are in whole single pieces instead of separate pieces stitched together. All stress points are double stitched for extra durability. Polyester thread is used for stitching, which is the same thread used for sailing ships and parachutes. It’s durable and expensive compared to the more commonly used cotton and nylon threads. Stress areas have stainless steel rivets installed. Polyester strips are glued to any area that is liable to stress or stretching. Extra strong glue that doesn’t weaken at high temperatures is used. Stainless steel rivets are installed at all stress points. 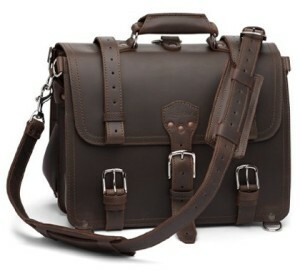 The Saddleback Leather Large Classic is the heaviest briefcase that I’ve reviewed thus far, weighing in at 7.6 lbs. It’ll be a lot more when it’s full of contents, so be prepared to use some strength carrying it around. However, the reasons for its weight is justified, and every lb counts towards something. It’s heavy but also heavy duty, and can be worn over the shoulder or as a backpack. As you can imagine, thick, tough and large pieces of full grain leather is heavy but very durable. There are also 8 D rings and 3 buckles all constructed of heavy duty stainless steel. When put together with the utmost superior craftsmanship, saying that this bag can withstand heavy usage is an understatement. So when you’re carrying it over your shoulder, you will likely feel the weight. Though there is an option to move the carry belt into a different position to use the briefcase as a backpack instead (you can also remove the carry belt as an actual belt which is quite a quirky feature), allowing carrying easier even if it doesn’t look as good as carrying it over the shoulder. I’ve decided to review the large size simply because it’s the most popular and ideal size for most people. It can carry up to a 15.4” laptop with ease, whereas the medium size struggles to even fit a 13” laptop. The large size also has a great amount of space inside. However, if you’re looking for even more space, then the obvious choice would be the extra-large size, which unless you’re a big guy, will look completely oversized. Though it may look like a bag without many compartments because it doesn’t have zippers everywhere, it’s quite the contrary because on the outside it has a large quick access compartment and two small pouches on both sides of the bag. And on the inside, you’ll realize there’s a sizable amount of space once you reach in with your hand and feel the depth of the bag. On both sides of the front compartment, there are two small pouches and two medium size pouches on the divider. 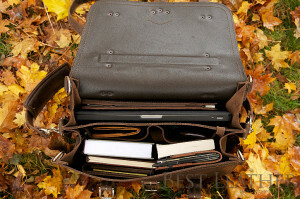 The second compartment is completely empty so it’s ideal for laptop or big books to fit in. If you interested to see how Saddleback Leather briefcases are made, I highly recommend you to watch the video below which details the material selection, design and construction process every bag undergoes. If you want a bag for life, then the Saddleback Leather Large Classic Briefcase is the perfect choice. Once you own it, you will learn to love it more and more after every use. It’s the ideal carry around companion for travel junkies and leather fanatics. If you often wear a suit or formal wear to work, then this briefcase will probably not be suitable for you. Its rugged and natural style is better suited for casual wear especially khaki or chino pants. Sure it commands a high price, but its price point is justified by the very precise and attentive construction process that has spawned a second-to-none quality briefcase. It’s also comforting to know that you have something that will never have to be replaced in you and probably your children’s lifetimes.